Knowing that God continues to each of us to move out beyond our comfort zones and to walk our faith journey alongside Christian brothers and sisters in other cultures experience a faith journey, Illinois Great Rivers Conference will launch a partnership with the United Methodist Churches in Honduras in August 2012. The first IGRC mission trip to Honduras is scheduled Aug. 18-26, 2012. The trip brochure is posted on the IGRC website and is also available by contacting bwolfe@igrc.org. An initial deposit of $500 per person is due on Feb. 18 and upon registration and payment of deposit, additional information will be forthcoming. The first team meeting is scheduled for March 11 at the Midwest Mission Distribution Center’s dormitory from 2 to 4 p.m. I am confident God will call United Methodists in IGRC to participate in this new and exciting opportunity in Honduras. If you feel God calling you to experience transforming fellowship, worship and service alongside brothers and sisters in the faith who are waiting to meet you in Honduras, act quickly. The team size is limited to 15 people and it is anticipated this initial Honduras mission team will be filled before the deposit deadline. Plans are underway for IGRC to help construct a mission complex in San Jose de la Vega, an area on the outskirts of Tegucigalpa, the capital of Honduras. It is anticipated that this project will take two to three years to complete and other teams from the United States will also be assigned to work at this location. As this project begins, the discussion to continue development of a conference partnership with Honduras continues as we seek God’s guidance and direction. Churches and individuals within IGRC have participated in volunteer mission teams traveling to Honduras over the past several years. Last fall, Alton Main Street UMC hosted the GBGM Honduras Consultation and invited United States partners and guests from Honduras to plan together for future partnerships and how we may all work toward common goals. This consultation was the beginning step in developing an IGRC mission partnership with the United Methodist Church of Honduras. The United Methodist Church of Honduras is a mission initiative of the General Board of Global Ministries. The Honduras Initiative began in 1994, but today the United Methodist Church in Honduras has 12 vital congregations and many others under development. 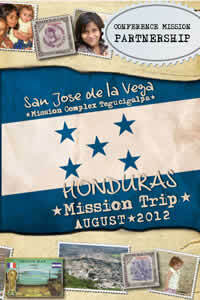 Click on the brochure cover to open the PDF file of the August 2012 Mission Trip brochure. Right-click on the brochure cover and select "Save Target As..." to save the brochure to your computer.